Micro-organisms are present everywhere; in the air, in water, on plants and in the soil. They can remain dormant for long periods in many different ways, as spores, mitochondrion (a membrane-enclosed organelle found in the cells of most organisms) or hyphae, and they can live up to several years and on a wide range of hosts. Although most people think of micro-organisms as being harmful by definition, life as we know it would not be possible without these minuscule life forms. In this article we will look at how they affect the growth of plants through their presence in the growing medium. Micro-organisms include a very broad range of species, and include bacteria, protozoa, algae and fungi. Most of these micro-organisms can multiply rapidly when the circumstances are right and they can have a major influence, both positive and negative, on the development of plants growing in the substrate. The kinds of micro- organism that appear in a given substrate will depend on a number of factors, such as the climate, the properties of the substrate, the plant species and the other organisms present in the substrate. Micro-organisms can significantly affect the development of plants growing in the substrate, both positively and negatively. Many factors are important for micro-organisms, such as the type of growing medium. Others include the amount of oxygen, the temperature of the substrate and roots, the pH level and the salinity or EC level in the substrate. Another aspect that has quite an impact on the micro-life in the growth medium is the presence of pesticides. One of the most important factors that influence micro-organisms is the type of growing medium available to them. The main differences can be found between organic substrates, such as coco coir, peat or soil, and inorganic substrates such as clay pebbles, perlite or rock wool. Micro-organisms that have a high saprophytic capacity (i.e. they live off dead organic matter) will do better in a substrate containing organic material such as peat or re-used substrate. 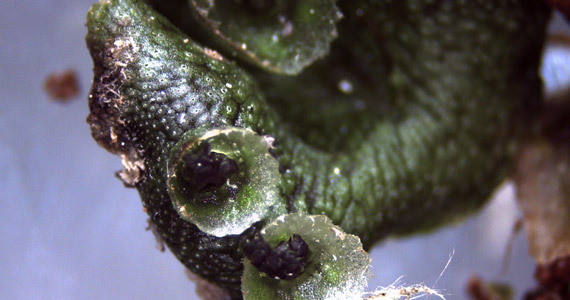 But dead leaves lying on the surface of the substrate or infected plants with necrotic parts will do just as well. The amount of oxygen in the substrate determines if aerobic or anaerobic micro-organisms will develop. Most plants need oxygen around their roots, so normally aerobic organisms will be present. Plants grown in a substrate with very little oxygen will usually be weaker and pathogenic anaerobic micro-organisms can benefit from that. All organisms have an optimum growing temperature, so the temperature of the substrate and roots will affect the micro-flora around them. The average temperature and the temperature range (cold nights or a hot summer day) will determine which micro-organisms can survive, as well as the range and frequency of temperature fluctuations. 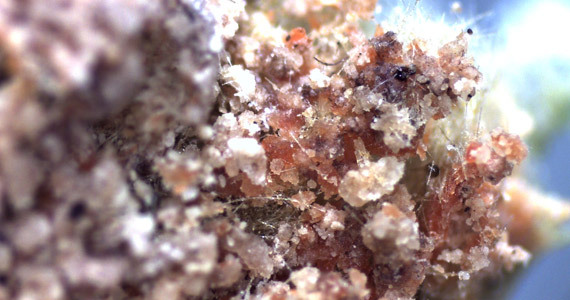 Fungus growth on rock wool cubes. 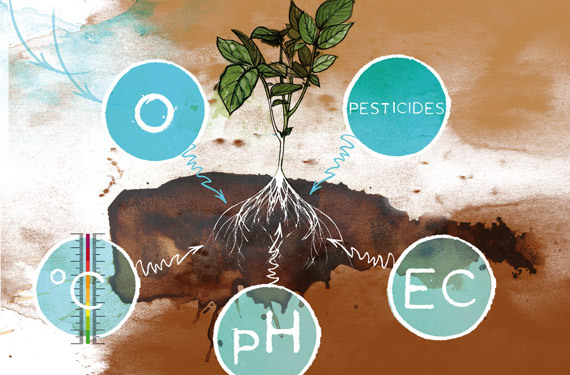 Just like plants, most micro-organisms prefer an acidity level of between pH 5.5 and 5.8. high and low pH levels, as well as pH fluctuations can disturb the development of micro-flora. still, some micro-organisms are able to grow or even flourish in extreme conditions. The salinity or EC level in the substrate will also affect the growth of the micro-organisms, and the type and composition of the salts in the growing medium also has an impact. This is especially true of salts such as Potassium chloride or Sodium chloride that can change the rhizosphere of plants and thereby the kinds of micro-life which will populate the root zone. In inorganic substrates such as rock wool, clay pebbles or perlite, most micro-life is waterborne. These micro-organisms are introduced via watering systems, air or plants and will survive as long as the moisture level is sufficiently high, even if there are only small pockets of moisture. As with soil-borne micro-organisms, these can also be either beneficial or pathogenic. Another aspect that has quite an impact on the micro-life in the growth medium is the presence of pesticides. These can build up in substrates or soils that are used for a prolonged period of time. Depending on the kind of pesticides – either herbicides, insecticides, fungicides or bactericides – these will influence the composition of microscopic life in the substrate. One thing that one can rely on is the fact that micro-organisms can adapt to a range of circumstances. A well-known example is the resistance of some bacteria against antibiotics; it only takes a fractional change in their genetic material, but the effect on the resistance can be all-important. The presence of micro-organisms can have both a positive and negative impact. As such, it is not necessary or desirable to get rid of all micro-organisms. The ability of a crop to defend itself against infections depends largely (albeit not exclusively) on the presence of micro-life in the substrate. It is difficult to quantify this benefit, however, since there are numerous factors on which the micro-life depends. The defense relates to the total microbial activity, the diversity of different groups of functional actinomycetes (rod-shaped bacteria), the total population of actinomycetes and the percentage of cellulose-decomposing actinomycetes. If there is a good balance of micro-life in the substrate, there will most likely be less need to use pesticides and other measures, which will reduce costs. Not only are fewer and fewer pesticides actually permitted in horticulture and other applications, they are also very expensive. Plus, in a sterile substrate the most opportunistic micro-organisms will find a free space with no competitors and unlimited access to space and nutrients. These first opportunistic colonists will not necessarily be beneficial to the crop planted in the substrate. It is wiser to use the correct micro-life from the beginning to produce a healthy crop and good yield. Micro-organisms can even be used to improve the quality of reused substrates, where certain bacteria actually produce enzymes that can decompose accumulated salts. 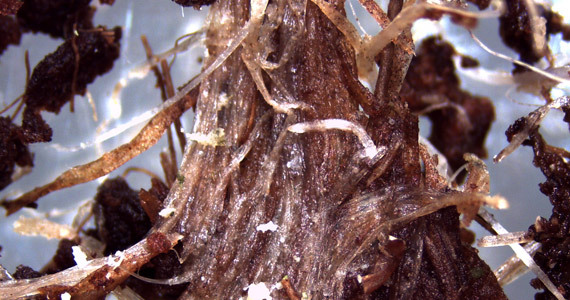 Pythium infection on tomato roots in coco coir. Substances that are exuded from the root system like sugars, amino acids or phenols can either attract or repel micro-organisms. The position of each species in the competition game that is continually going on between the bacteria can be influenced by these root exudates. Plants can use this to its advantage by exuding substances that attract beneficial organisms, establishing a symbiosis with a particular micro-organism. A prime example is the presence of symbiotic bacteria in the root nodules of leguminous plants such as peas or beans, which convert atmospheric nitrogen into a form that can be absorbed and used by the plant. Another tactic is to introduce certain benign organisms to suppress pathogens. This works as follows. some micro-organisms are not very competitive and have a hard time colonizing a substrate that is already occupied by other micro-organisms. This can serve as a mechanism to get rid of pathogenic micro-organisms. By introducing beneficial micro-organisms such as mycorrhiza or trichoderma fungi into a clean substrate, the growing medium will become less inviting for pathogenic micro-organisms, thus protecting the plant from becoming infected. Beneficial microbes compete with pathogens for nutrients or glucose and some antagonists have their own method of winning a competitive edge. For example, the fluorescent Pseudomonas bacteria can produce proteins that transform slightly soluble iron (Fe) into iron chelate, which it can then absorb much more easily. This then deprives the Fusarium fungi of the iron it needs to grow, preventing it from developing. competition for glucose can also cause microbiostasis which means that the spores of that pathogenic fungus germinate much more slowly due to a lack of energy from glucose. Antagonistic micro-organisms can also block one or more stages of the propagation cycle of pathogens. Pseudomonas species P. Stutzeri, for example, interrupts the formation of conidia (asexual spores of several kinds of fungi) and the formation and germination of chlamydospores (thick-walled dormant spore of several kinds of fungi), but has no effect on mycelial growth (mycelial cords are capable of transferring nutrients over long distances). Pseudomonas can also produce antibiotics, which can be another tactic to remove pathogens, while other micro-organisms produce enzymes that attack the cell walls of competing species. Antagonists that produce chitinolytic enzymes have the potential to act against pathogenic fungi. It has also been found that several antagonistic organisms or closely related species can co-operate to fight a pathogen. Other antagonists simply overwhelm a pathogenic micro-organism by multiplying more rapidly and thus depriving all the competition of resources and therefore any chance of survival. Algae development on rock wool cubes. Micro-life in the substrate also comes in the form of soil- or water-borne pathogens. some of these pathogens can attack over 80 different plant species and their resilience means they can be very important. There are many different harmful micro-organisms which result in a range of infections and symptoms (rotting fruits, fading, and necrosis to name but three). Some pathogens produce micro-toxins which can attack the plant or the micro-life in the substrate. Pathogens can gain an advantage over other micro-organisms when they are able to germinate faster and are able to remain dormant for a longer period when conditions are not optimal. Pathogenic and non-pathogenic species can be very closely related, which makes it hard to use antagonists or other measures. Pathogens can fight back when they are attacked by antagonists. an example is fusarium, which can produce fusarium acid that affects the plant cells but can also suppress the production of antibiotics of Pseudomonas (this was discovered through research at Wageningen University in the Netherlands). Most infections by pathogens are in fact the result of a plant that was weak to begin with. Healthy plants are resilient and will be able to respond to an infection by micro-organisms. Provided the plant’s responses are quick and strong enough, it will be able to overcome such an infection. As such, ensuring an optimal climate and soil conditions for the crop is even more important than optimal growing conditions for (beneficial) micro-organisms. It is crucial to get a good balance of micro-organisms in the substrate over a prolonged period of time, yet sometimes the growth cycle of a plant is simply too short to achieve this balance. Inoculating the substrate with antagonists is possible and, although the results are not always consistent, in some cases this can have a very positive effect on plant growth and health. In some cases, the results are comparable to the effect of using chemicals like fungicides, although these results may not last throughout the entire growing season. Micro-organisms in the substrate can be a great help in suppressing plant diseases and a great deal of research is being conducted in this area of horticulture. Although this technology has still not entered the mainstream, research by the Louis Bolk Institute in the Netherlands has shown that introducing beneficial micro-organisms and or adding compost to increase the amount of micro-life can have a major effect on crop performance.